Safe, reliable transit, from our doorstep to yours. Be confident your orders will arrive on time and in good condition with aiFAB’s packing and manufacturing logistics services. From surface-finished and assembled kit systems, to standard metal extrusion orders, aiFAB takes care to deliver without damage. We can even package and deliver your finished product direct to site, branded with your logo, ready to be sold or installed. Why waste time worrying about delivery? Let the aiFAB logistics team take the problem off your hands. 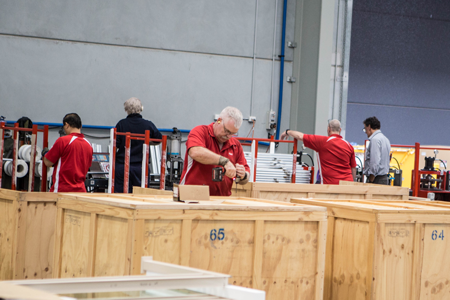 AiFAB provides safe, secure packaging of all finished goods for transport and delivery. Our packaging standards ensures your order is protected from scratches or surface damage during delivery. All orders are professionally packaged into boxes, cases or stillages to suit your needs and requirements. Some think we go a bit over the top with our wrapping, but we think your order is important and worth the effort. For partner customers, we can brand your delivery with your company logo for a more professional finish, and project manage your product all the way to your doorstep. Manufacturing logistics is key to aiFAB’s simplified project management system, and your increased efficiency. 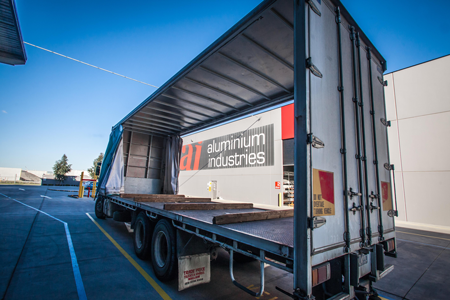 We seamlessly move your metal from work centre to work centre, and from our warehouse to your warehouse. Your aluminium extrusions move from stock picking to surface finishing to machining to assembly to packing to dispatch to delivery, without you having to do a thing. High efficiency, reducing transit and wait times, ensuring faster turnaround for product and greater cost-savings to pass on – this is what aiFAB is all about. Stop chasing orders. Our team can show you the benefits of aiFAB’s manufacturing logistics systems for your business. Find out how we can help manage your production processes.